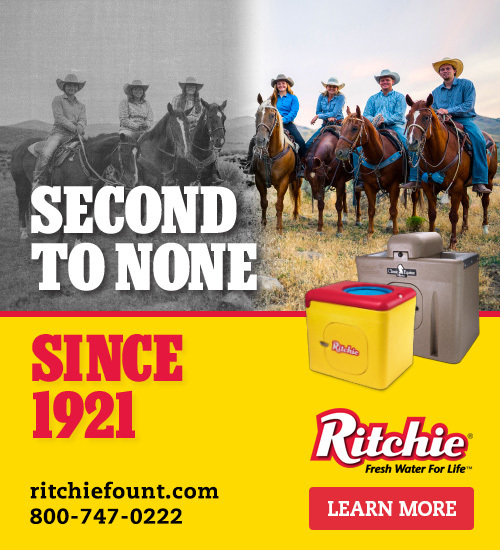 A Complete Line Of Watering Products by Ritchie Industries Inc.
With over 85 years of service to the equine industry, Ritchie Industries offers horse owners a complete line of watering products for both stalled horses and horses kept outdoors. Iowa native Thomas Ritchie patented his first water device in 1921 by connecting underground running water that used automatic float-controlled watering equipment, heated with a kerosene lamp. Farmers liked the labor-saving qualities of Thomas Ritchie's patented waterer, and a new business was born. Today, over 85 years later, Ritchie Industries offers a complete line of animal watering products, and can point with pride to an unmatched reputation for quality and integrity. We get orders from farmers who tell us they're still using an original Ritchie fountain they bought 30, 40 years ago, that history of quality is what guides us in the manufacturing process today, so when you buy a Ritchie, you know it's going to work for a long, long time. What Is The Ritchie Philosophy? Fresh water on demand, 24 hours a day describes what our fountains deliver. 10 year limited warranty! Fresh Water – To provide fresh water, Ritchie uses a shallow trough so when your animals come to the fountain, there is a minimum of standing water, and when they start drinking, they will be getting water fresh from the water line. Ritchie's fountains are also quick and easy to clean for your animals' well being. On Demand – Animals will not have to wait for water from our fountains. Ritchie's rapid refill valve will keep up with your animals drinking demand, they will not let the trough run dry. We understand our fountains will be placed in locations with a variety of water supply pressures, and we offer alternate valves to compensate for these conditions. We've taken all we've learned over the years and put the top value, best performance, easiest operation, and maintenance in the WaterMatic Family! The 100 is our smallest poly fountain with a single trough. The 150 and 300 have two troughs; either one or both can easily be closed off simply by changing the position of a drain plug. The 1000 has a 13 foot perimeter, and an all around drink area. What Features Does WaterMatic Offer Horse Owners? The WaterMatic Family features Ritchie's drop-in cover design, with the ease of finger lift service, and the insulation of the patented water seal. All surfaces slope to the drains for easy clean out. Drain plugs can be moved to the valve chamber openings for short-term trough shut-off during cleaning, when your pen is empty, during excessively cold nights, or when you don't want your animals drinking. Does Ritchie Offer Wall Mounted Fountains? There are Ritchie Distributors throughout the United States, Canada, Japan, Holland, Italy, and the Ukraine. They are happy to answer your questions, take your orders or just pick up the phone and call Ritchie Fount office today!